Nowhere has Mitt Romney&apos;s pursuit of the presidency been more warmly welcomed or closely followed than here in Utah. The Republican nominee&apos;s political and religious pedigrees, his adeptly bipartisan governorship of a Democratic state, and his head for business and the bottom line all inspire admiration and hope in our largely Mormon, Republican, business-friendly state. But it was Romney&apos;s singular role in rescuing Utah&apos;s organization of the 2002 Olympics from a cesspool of scandal, and his oversight of the most successful Winter Games on record, that make him the Beehive State&apos;s favorite adopted son. After all, Romney managed to save the state from ignominy, turning the extravaganza into a showcase for the matchless landscapes, volunteerism and efficiency that told the world what is best and most beautiful about Utah and its people. Sadly, it is not the only Romney, as his campaign for the White House has made abundantly clear, first in his servile courtship of the tea party in order to win the nomination, and now as the party&apos;s shape-shifting nominee. From his embrace of the party&apos;s radical right wing, to subsequent portrayals of himself as a moderate champion of the middle class, Romney has raised the most frequently asked question of the campaign: "Who is this guy, really, and what in the world does he truly believe?" The evidence suggests no clear answer, or at least one that would survive Romney&apos;s next speech or sound bite. Politicians routinely tailor their words to suit an audience. Romney, though, is shameless, lavishing vastly diverse audiences with words, any words, they would trade their votes to hear. If this portrait of a Romney willing to say anything to get elected seems harsh, we need only revisit his branding of 47 percent of Americans as freeloaders who pay no taxes, yet feel victimized and entitled to government assistance. His job, he told a group of wealthy donors, "is not to worry about those people. I&apos;ll never convince them they should take personal responsibility and care for their lives." 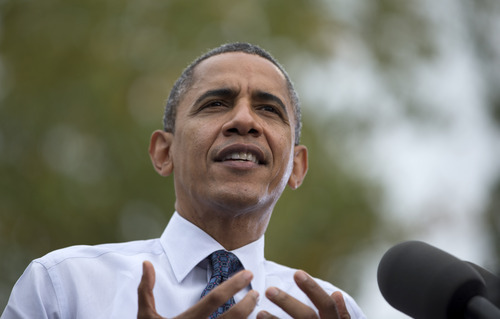 In the first months of his presidency, Obama acted decisively to stimulate the economy. His leadership was essential to passage of the badly needed American Recovery and Reinvestment Act. Though Republicans criticize the stimulus for failing to create jobs, it clearly helped stop the hemorrhaging of public sector jobs. The Utah Legislature used hundreds of millions in stimulus funds to plug holes in the state&apos;s budget. The president also acted wisely to bail out the auto industry, which has since come roaring back. Romney, in so many words, said the carmakers should sink if they can&apos;t swim. Obama&apos;s most noteworthy achievement, passage of his signature Affordable Care Act, also proved, in its timing, his greatest blunder. The set of comprehensive health insurance reforms aimed at extending health care coverage to all Americans was signed 14 months into his term after a ferocious fight in Congress that sapped the new president&apos;s political capital and destroyed any chance for bipartisan cooperation on the shredded economy. Obama&apos;s foreign policy record is perhaps his strongest suit, especially compared to Romney&apos;s bellicose posture toward Russia and China and his inflammatory rhetoric regarding Iran&apos;s nuclear weapons program. Obama&apos;s measured reliance on tough economic embargoes to bring Iran to heel, and his equally measured disengagement from the war in Afghanistan, are examples of a nuanced approach to international affairs. The glaring exception, still unfolding, was the administration&apos;s failure to protect the lives of the U.S. ambassador to Libya and three other Americans, and to quickly come clean about it. In considering which candidate to endorse, The Salt Lake Tribune editorial board had hoped that Romney would exhibit the same talents for organization, pragmatic problem solving and inspired leadership that he displayed here more than a decade ago. Instead, we have watched him morph into a friend of the far right, then tack toward the center with breathtaking aplomb. Through a pair of presidential debates, Romney&apos;s domestic agenda remains bereft of detail and worthy of mistrust.